Sadly, one in five children in the UK start school overweight or obese. By encouraging healthy food and eating habits early on, we can encourage and steer children towards the right behaviours, setting them up for healthier futures. By providing healthy and nutritious food, we can also help young children to get the best from their days, improving concentration and helping them get more out of learning and playing opportunities. Mealtimes are a sociable occasion and an opportunity to learn. We promote the children’s independence by encouraging them to feed themselves. 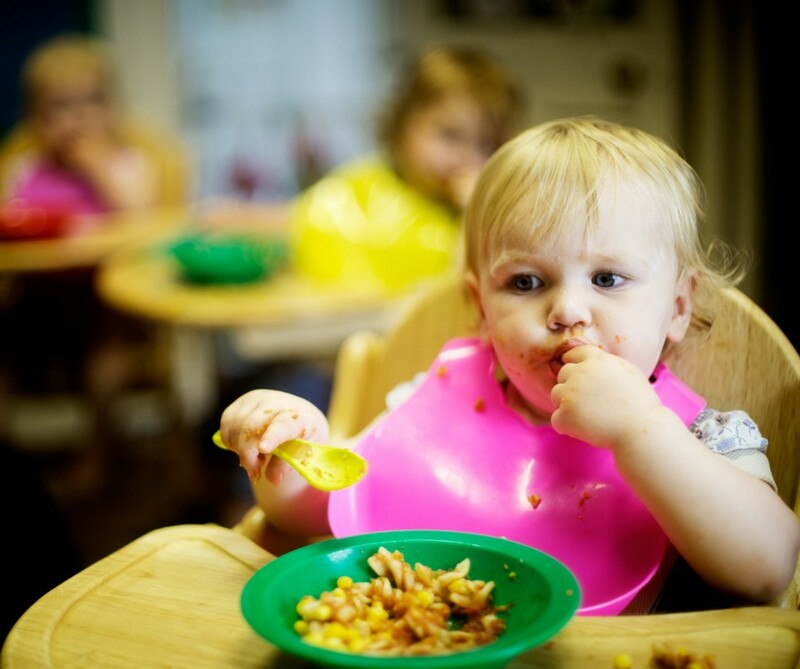 Pre-school children serve up their own lunch and even clear away their own plates. We promote good manners and food etiquette as staff sit with the children and share stories and laughter. Children learn about healthy eating in the nursery with various projects and topics that are covered. At mealtimes staff encourage children to try different foods and talk about the importance of eating healthy to grow up big and strong. If your child has any special dietary needs based on medical/allergy conditions, religious, or cultural requirements, just let us know and our nursery chef will be happy to discuss this with you. We want you to be confident that we at Archfield House Nursery are committed to providing healthy and nutritious food and the appropriate environment for good nutrition. We have made a commitment to healthy eating in our nursery by joining the Early Years Nutrition Partnership programme, an independent social enterprise working to improve the future health outcomes of young children. We are now working alongside the EYN Partnership’s Nutritionist Alison Preston benefitting from their expertise and the tailored support they are providing to our staff and the children in our care. We will be working with Alison Preston on developing our menus, reviewing our food policy and thinking about how we teach the children in our care about healthy eating and positive mealtime experiences. EYN Partnership resources have been developed using the expertise of the British Nutrition Foundation and the Pre-school Learning Alliance with guidance from the EYN Partnership Expert Panel. We look forward to bringing you news about the work we are doing as part of the EYN Partnership programme, and working with you to help further develop our approach to early years nutrition. Watch out for Kitchen Corner in our monthly newsletter for updates on our EYN Partnership journey. You can learn more about the Early Years Nutrition Partnership programme and find plenty of hints and tips and resources for you as parents and carers by visiting the website eynpartnership.org http://www.eynpartnership.org, visiting the EYN Partnership YouTube Channel or following @EYNpartnership on Twitter.